Pierre from Washington DC asks: Kurma, an Iranian friend invited me to dinner and her mother served a very nice creamy sort of cardamom rice flour milk pudding. Would you have a recipe? 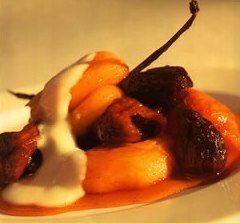 Succulent stewed dried fruits couple wonderfully with the ubiquitous Middle Eastern rice flour pudding known as muhallabeya, sometimes spelled muhallabia. Every community has its own traditional flavourings and presentation for this pudding, some flavouring it with orange blossom water, or rose water, and sprinkling it with chopped almonds or pistachios. The Turkish version uses vanilla or lemon zest, whereas the Iranians prefer cardamom. Serves 6. Soak the figs in hot water for 1 hour. Drain. Combine the sugar, vanilla bean, cinnamon stick, zest and citrus juice in a saucepan, along with 1½ cups of water. Bring to a boil, reduce the heat and simmer for 10 minutes. Add the dried figs along with the rest of the dried fruits, and simmer with a tightly fitting lid for ½ hour or until the fruits are tender. Cool to room temperature. Serve with the fragrant milk pudding. Whisk the rice flour with a cup of the cold milk, adding it gradually and mixing thoroughly to avoid lumps. Bring to the boil the rest of the milk in your heaviest pan. Whisk in the rice flour and milk mixture, stirring vigorously. Cook on very low heat, stirring continuously for 10 to 15 minutes, or until the mixture thickens. Whisk in the sugar until dissolved then remove the saucepan from the heat and pour in the rosewater. Whisk the whole mixture until creamy smooth, and chill. Serve: transfer the pudding to a large serving bowl, or individual ones, and sprinkle with the chopped pistachio nuts. Serve as an accompaniment to the fruit compote.